Oh my, how our family life has changed since dōTERRA essential oils entered it in October 2013! I’ve always been an avid user of essential oils, having used aromatherapy for over 20 years. And of course I love making magic with food. However, until dōTERRA entered my life, I wasn't able to combine the two to create the food I do now, infused with potent, pure, essential oils. My dōTERRA journey has been featured in the dōTERRA Leadership magazine for May/June 2015 which you can read here. Many of these essential oils are safe to ingest, identified by the supplement label on the bottle. And these oils are not only food grade, they are therapeutic grade. The dōTERRA standard, called Certified Pure Tested Grade or CPTG, is the dōTERRA commitment to providing the best possible essential oil products, through stringent testing, sourcing, growing and harvesting practices. I value this so highly. I only recommend the use of dōTERRA essential oils because of this purity. And their oils are ethically sourced from around the globe by a company committed to making the world a better place through their Co-Impact Sourcing and Helping Hands projects. Watch the impact of Co-Impact Sourcing. Essential Oils can provide immense and versatile support for your mind, body and soul simply, safely and naturally. And I haven’t even started on how good they are in food! 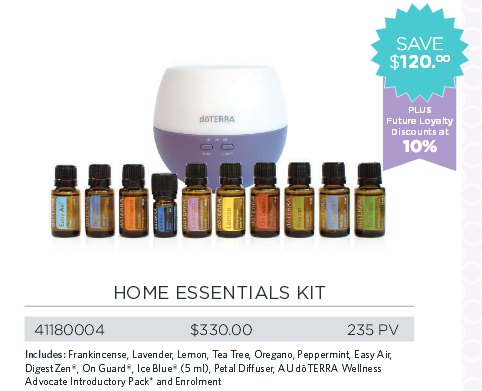 There is a one off enrolment fee of $35 for the 1st year, which dōTERRA absorb when you purchase one of their great value kits (see below). And renewing after the 1st year costs $25, which dōTERRA also absorbs by giving you a free 15ml bottle of peppermint oil! This company has extremely high standards, as well as being incredibly generous. dōTERRA creates your own personal virtual internet office site to place your orders. Ordering is easy and there is always someone to call (a real voice) to ask for help if you need it. 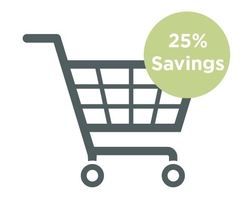 Click here to enrol in a wholesale account and enjoy the savings. The best value offered by dōTERRA is signing up for the free Loyalty Rewards Program as part of your wholesale membership. With this monthly purchase program, dōTERRA rewards you for your commitment to their products by providing incredible additional benefits. It is the most intelligent way to order. Starting at 10%, and going up to a very generous 30%, dōTERRA lets you earn product credits on your purchases, which you can redeem for a small administration fee. Placing your monthly Loyalty Rewards Order totalling 125PV or more, shipped before the 15th of the month and you get a free oil, called the Product of the Month or POM. This oil varies each month and it is a terrific way to help you build up your oil collection. PV – what is this? dōTERRA place a point value or PV on every product they sell, to help create a common ground and product value since they are a global company covering many varied countries and currencies. The Loyalty Rewards Program gives you the ability to earn bonuses through various compensation schemes that can help you pay for your oils, or replace your full time income. The choice is entirely up to you. I would be honoured to show you how you can do this; I have empowered many people to realise their dreams. Getting started with a kit is a great introduction to essential oils. dōTERRA absorb the wholesale account fee of $35 and provide greater savings than purchasing the oils individually. They have also taken the guess work out of wondering which oils to order by putting together a collection of really useful oils that you’ll use again and again. This is a great introductory kit of 10 x 5ml bottles of oils and 1 x 15ml bottle. There is a lot you can do with this kit, click here to find out more. Even greater savings can be had by purchasing this kit. It has three times the volume of essential oils than the Essential Collection kit, plus it includes a diffuser so you can start using the oils aromatically. 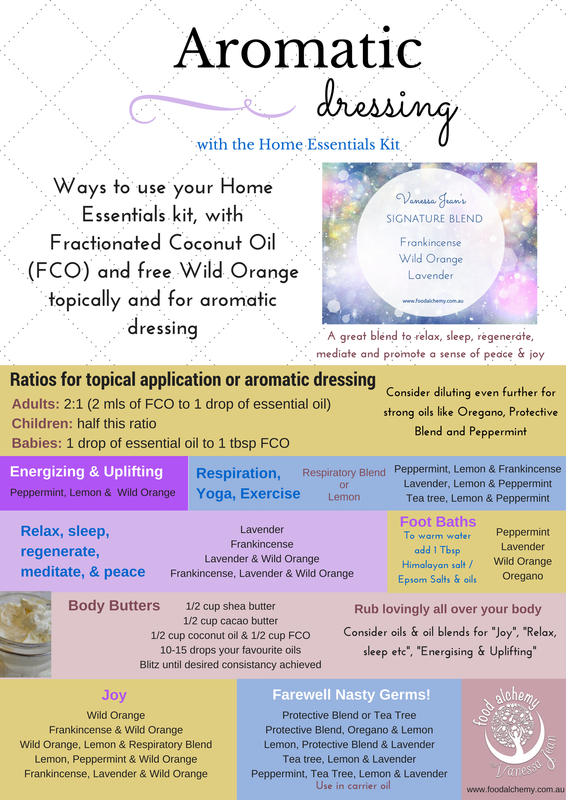 Then just add a fractionated coconut oil (FCO) to the kit and you can safely use the oils on your body. FCO is like liquid velvet. It is a carrier oil that is readily absorbed by the body, hydrating and nourishing it. I believe what we put on our skin, the largest organ of our body, should be good enough to eat. These oils are! When using the essential oils topically we recommend using a carrier oil at all times. Please refer to dilution and safety information. 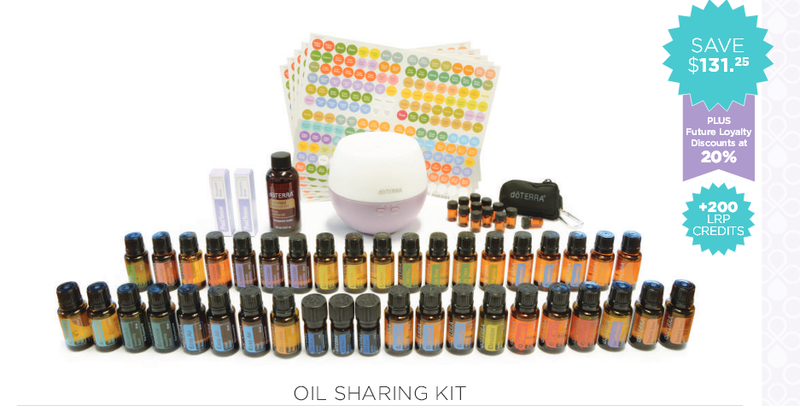 Consider this kit if you intend sharing oils. You save over $131, start on a higher Loyalty Rewards percentage (20%), and dōTERRA give you 200PV in credit towards future purchases. Nature's Solution Kit - best value savings! ​This is the best value enrolment kit that packs a punch in savings. The recommended retail price for all these incredible products is $1,124.42. 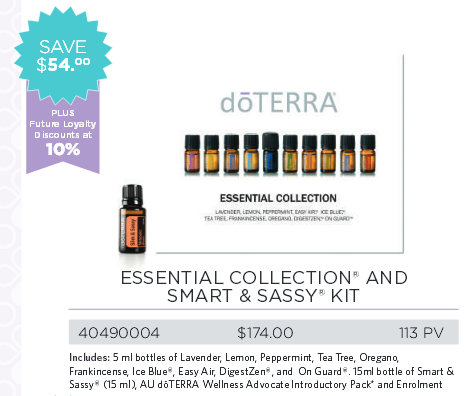 As an enrolment kit, it costs you $635 + shipping, and includes your wholesale membership. That is a saving of $464.47! And, when you place an order of 100PV value or more the following month (approximately $120 worth), you will receive 100 free product points back to spend on whatever you like (over $100 value)! Oils: You receive 15ml bottles of Digestzen, Purify, Tea Tree, Oregano, AromaTouch, Frankincense, Lavender Peace, Easy Air, Citrus Bliss, Lavender, Lemon, Peppermint, Smart & Sassy, Lemongrass, On Guard, 10ml bottles of PastTense, Clary Calm and a 5ml bottle of Ice Blue. Oil products: Ice Blue Rub, Correct X, Fractionated Coconut Oil, Easy Air Vapour Stick, Petal Diffuser, doTERRA engraved wooden box, On Guard Cleansing toothpaste, On Guard Foaming Handwash (with 2 Dispensers), On Guard Beadlets, an introductory pack and it includes your enrolment (valued at $34). Maybe you have a specific way you want to incorporate essential oils into your life and the kit options don’t suit. No problem at all! You can cherry pick the oils you love, include the wholesale registration fee, and you are good to go. To view the full range of products and kits that can be purchased from within Australia, click here. Prices are in Australian dollars. To view the full range of products available internationally, click here. All prices are in US dollars - exchange rates apply. To view the current catalogue, click here. I am happy to answer any of your oil questions, or run a class for you to help you on your oil adventure. ​Please call me on 0410 421 213 or email me. Much of my site gives you ways to help incorporate essential oils into your daily life. 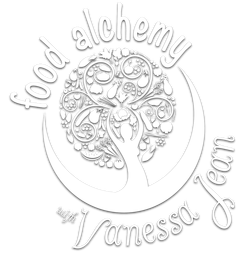 I have blends to diffuse and aromatically dress, food recipes to tempt you and food and oils classes for you to join. Have I inspired you to welcome the dōTERRA essential oils into your life? I hope so. Please contact me on 0410 421 213 or email me if you would like to know more. 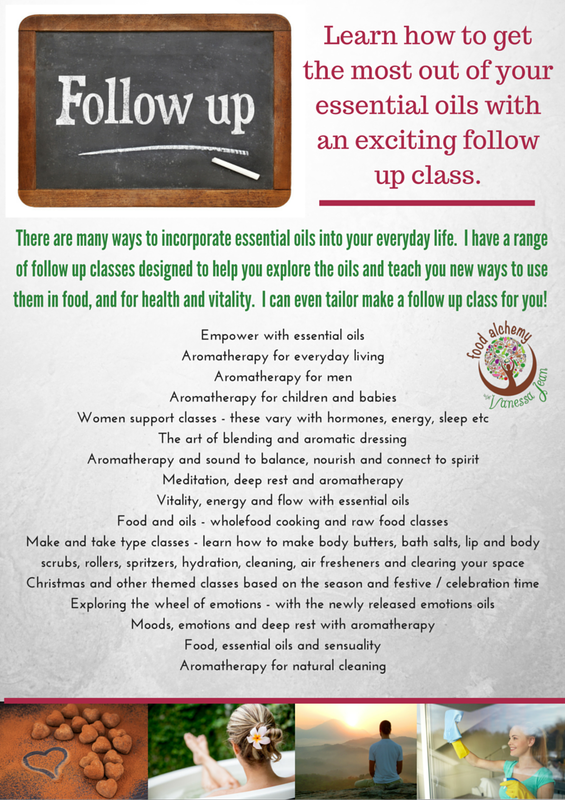 And if you want to get more out of your essential oils, come along to an exciting follow up class.